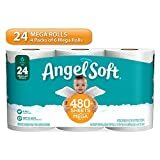 24 mega rolls with 484 sheets in every roll = case of 96 regular rolls. Sewer-safe, septic-safe, flushable 2-ply toilet tissue with an ideal balance of softness and strength. Manufactured from pulp fiber with no additives. Mega rolls that fit in most roll holders, for less frequent roll changes.